They should have milked it for all it was worth. Isn't everything grandy and dandy ? I hope the fucker didn't get paid for that crap. I didn't guess Sri Lanka I thought he might be skimming the Kremlin money for the Standard Brexit ads. I wonder exactly how quickly the Shinners can get enough signatures on paper. This day week, at the very latest. Big Ian would have booted him square in the balls for getting caught so easily, with no-one else to blame. How did he forget? Does he take a helicopter to Martha's Vineyard every weekend? The DUP has suspended him. 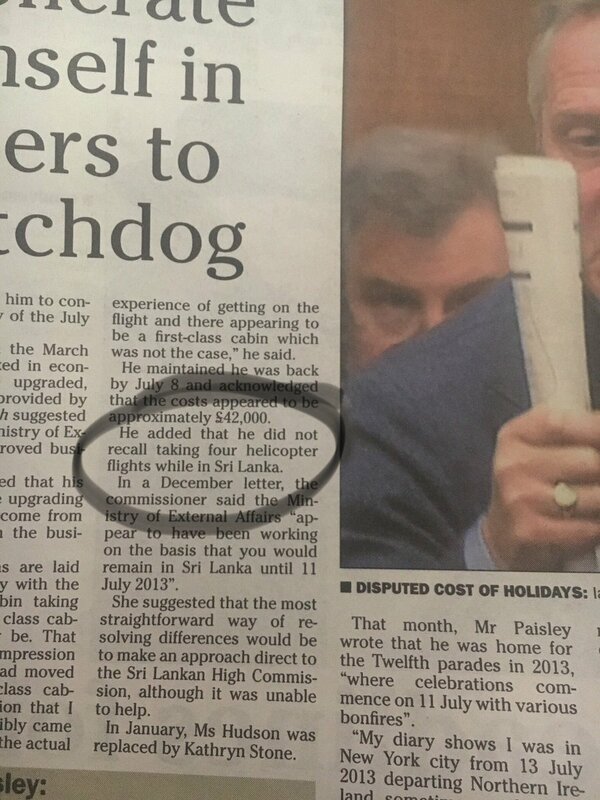 I can certainly remember both of my helicopter flights. Only for 30 days, which is a shame. He could be back to run in any by-election, and I'd pay good money to see what kind of human effluent would be the second choice if Junior is the best they can do. Does this not trigger a possible recall election? The Shinners polled 7800-ish last time out, Alliance and SDLP about 5k together, so I doubt that's going to be a problem. The DUP have a ridiculous majority, literally more than the rest put together, so no doubt they'll win it again, and this won't be a "six pointer", so to speak.